Sweet 2000 Madame Alexander "My Little Gardener," looks like a garden in bloom! Wendy wears a floral print smocked dress, with white lace trimmed slip and bloomers, white socks and yellow patent side-buckle shoes. 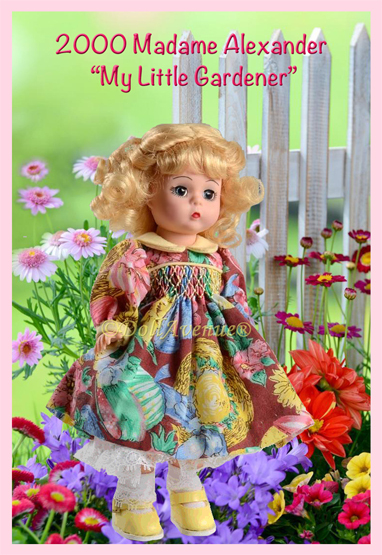 She has full, bouncy blonde curls with bangs, blue eyes and softly blushed cheeks. She will arrive in preowned, but minty condition with her original box and hangtag.